Its 10th of the month and time for Muslim Food Bloggers Challenge. I know I am writing up the post pretty at the last moment.. but was totally caught up in a new project I ve taken up.. hopefully in sha allah it works out successfully .. So whats the topic for this months Challenge? POMEGRANATE .. yes.. the little jewels adorn the topic. Today its a simple and easy to make salad i am posting using pomegranate.. and with this post there is a new template I would like to bring to the blog. Of lately if you have been following my instagram and facebook I am putting up one page recipes... simple and easy to make and its one page. and in sha allah i am planning to post all the one page recipes posted there in the blog one by one and to begin I am starting with this beautiful and simple salad. 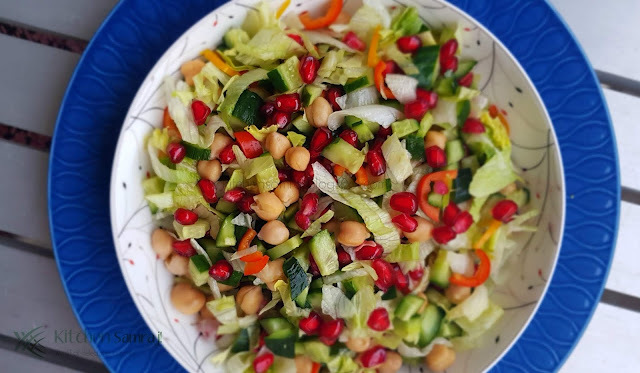 For the past two months I am packing salads for my hubby's lunch box along with boiled eggs and sometimes grilled chicken. its no diet.. viet.. he finds it easy to eat in his busy schedule and salads neednot be hot na.. 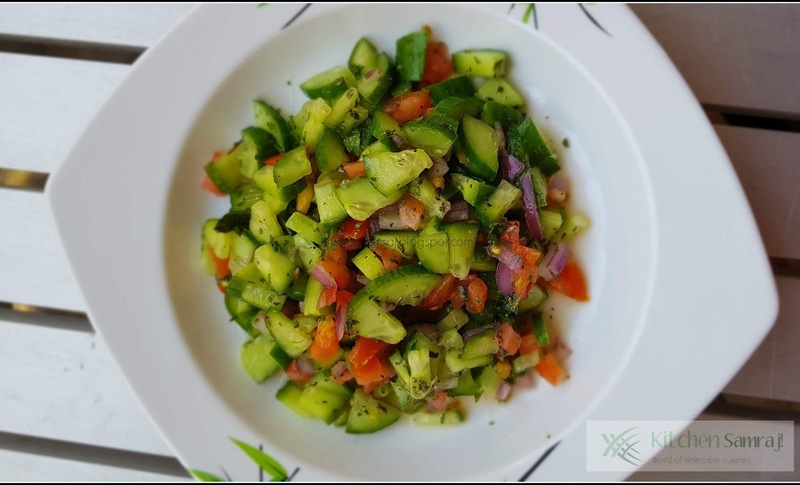 Slowly I also started to have these salad meals.. and we both found it to filling and not feel hungry for nearly 3-4 hrs. Making salad 5 times a week you have to don your thinking cap to keep up the enthu of eating salads..
basically I add cucumbers and lettuce either the regular / romaine / Iceberg and change the veggies with mini tomatoes, salad bell peppers, mini radishes, carrots, sometimes i try to add fruits like grapes, apples, oranges and toasted nuts.. actually raisins add beautiful sweet touch to the salad. 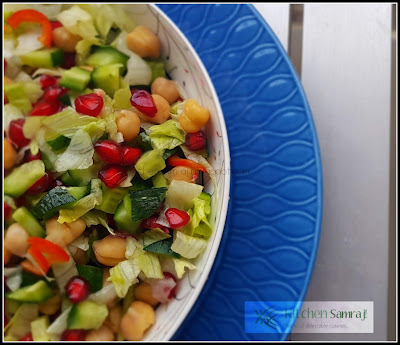 The salad dressing is cayenne pepper/ sumac/ chaat masala/ salad seasoning.. and at last add a handful of chickpeas or rajma . 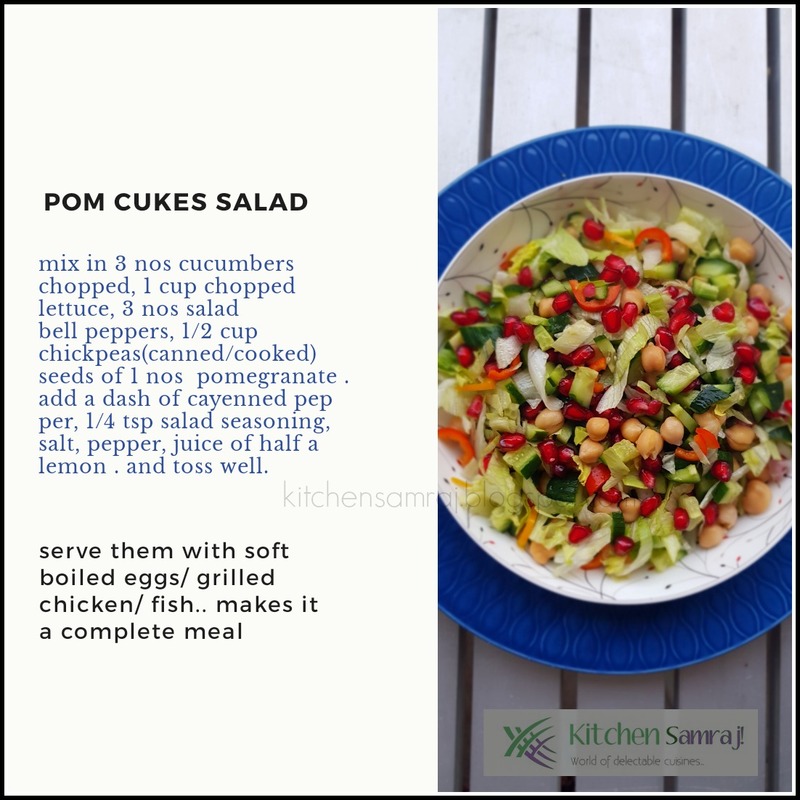 Serve it with soft boiled eggs or with grilled chicken or fish it makes a complete meal.. so lets head to the recipe. 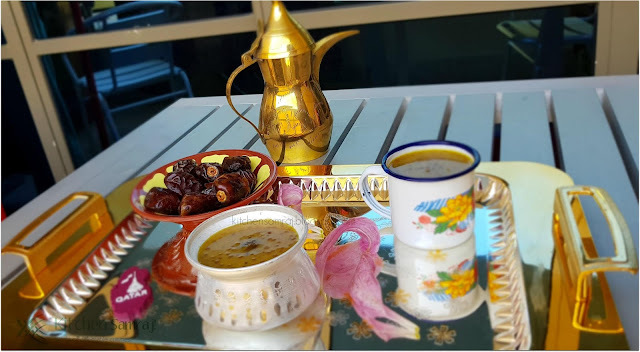 Today is Dec 18 Qatar National Day..The country is decked up with flags and lots of celebrations happening today.. As you can see my post here and here there has been special posts on QND.. This year too when I wanted to post I was confused as what to... so many recipes came to my mind but I wanted to do something very traditional. Habbat Al Hamra - is a drink made from Asario seeds / red seeds / garden cress seeds. It has many medicinal benefits and has also been used in medication during our beloved Prophet Muhammed(saws) time. the modern version of it uses custard powder but the traditional recipe uses spices like cinnamon, ginger powder, turmeric powder all which has exceptional medicinal benefits. Habbat al Hamra also helps when you have flu and cold . This drink traditionally is served to moms who has just given birth and also served as a welcome drink to the guests who come to see the new born. This drink is not advisable to take during pregnancy as there are chances of miscarriage. Heat a pan. Add ghee. then add the flour and fry till they are slightly browned. Then add cinnamon powder, ginger powder and turmeric powder. and fry for a couple of seconds. Add sugar to taste.. and cook till it done. it should be little thick and porridge like consistency. Back again with my favorite challenge of the month Muslim Flood Bloggers Challenge. Though there were few post that was supposed to be on blog in between couldn't post due to poor health.. no worries . hopefully they will pop in the blog soon.. This month's theme is Cooking from country - Iran. 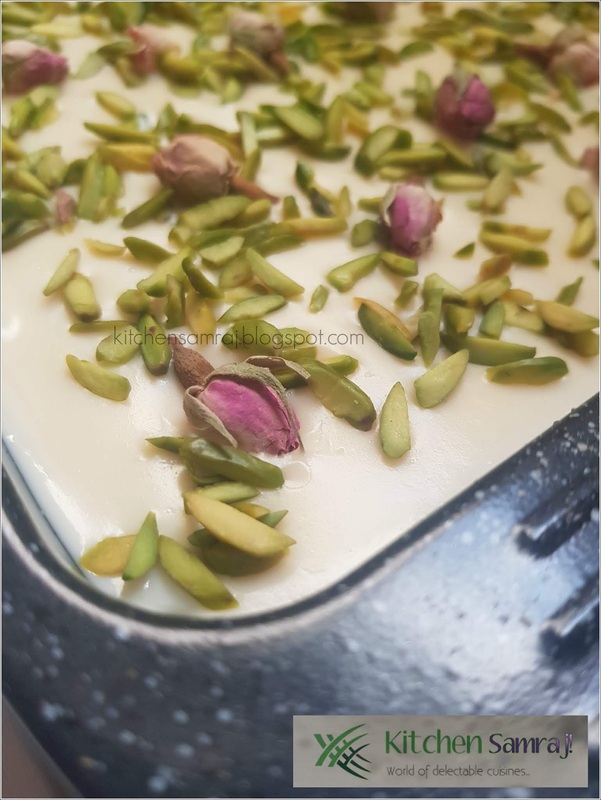 Was very excited when Rafeeda gave the theme .. Iranian or Persian cuisine is so versatile and I love their desserts and kebabs.. Persian Cuisine is always about the beautiful marriage of spices.. be it rice or meat or dessert the spice plays an important role.. was thinking what to choose rice? kebab? sweet? Super and excited .. borrowed a book " Pomegranate And Roses" by Araina Bundy from Qatar National Library, bookmarked a few recipes. . but fell sick and all plans went to drain. but the book on the table lured me.. at last chose this simple salad . Made them as an accompaniment to biryani two days back on Friday. But didnt make a blog post. Chop the cucumbers into even sized cubes. Deseed the tomatoes and chop them into even sized cubes. 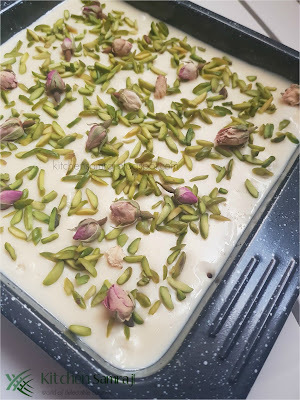 Coming back.. checked my phone if I had any photos of Arabic Sweets and there it was .. Aish El Saraya -- Arabic Bread Pudding. decided to make a blog post on it and participate in MFBC#22 Made them first time when my mom came to Qatar in the beginning of this year. 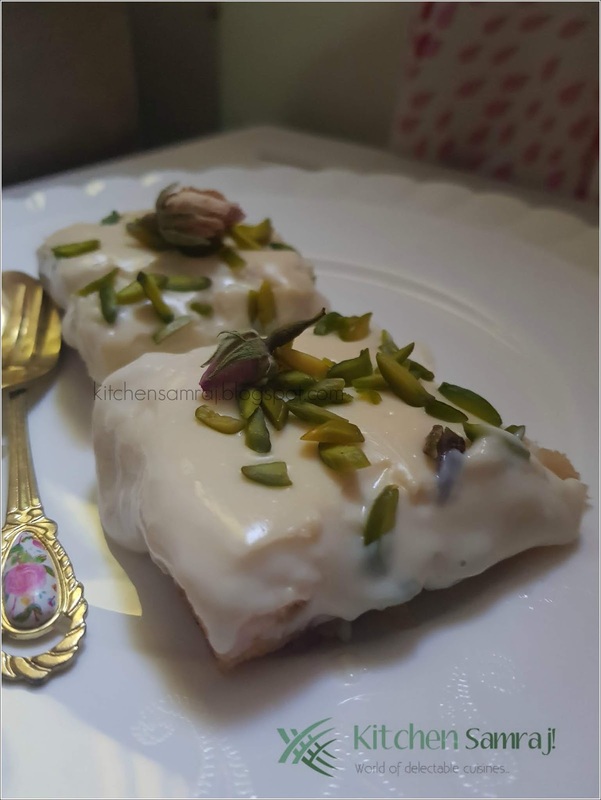 That month dear Shanaz posted this recipe and i was just attracted to it... and my mom's visit after 5 years gave me a reason to make this dessert. The dessert was very easy to prepare and absolutely delicious. Check here for the original recipe from her website. Take a large baking tray 9*13 inch and line the toasted bread in a single layer or as a double layer. if there are any gaps you can fill them with broken or powdered toasted bread. In a saucepan add the sugar and water and dissolve it over medium heat. Once the sugar dissolves cook for about 2 minutes. Remove from heat. Add the lemon juice, Rose Water and Orange Blossom Water. Pour the prepared Sugar syrup over the prepared toasted bread and set it aside. Mix in the cornflour in half a cup of milk. In a saucepan add the rest of the milk, cream, condensed milk, rose water and orange blossom water. Mix well. Bring it to medium heat and add the cornflour milk mixture and stir continuously. Take care to avoid lumps. Use a whisk for a smooth custard. In around 10 minutes the mixture will start to thicken and form a pouring consistency. Remove from heat and allow to cool for about a couple of minutes. Pour this custard over the soaked bread evenly. Sprinkle pistachios and Rose Buds. Allow to cool completely and Refrigerate for 5-6 hours. I used Whipping cream for this recipe. I have used milk rusk here for more milky flavour. you can use any toasted bread of your choice. The use or rose buds is completely optional.